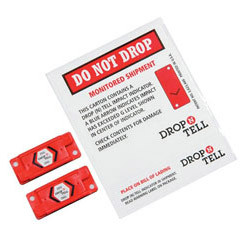 Spot concealed shipment Damage at the time of receipt of delivery with the Drop 'N' Tell impact Damage indicator. Self Adhesive allows for easy mounting The indicator sensor displays a blue (almost black) arrow if the container receives a Shock exceeding a specified G range. Available in both re-settable and NON-resettable. Resettable can be reused up to 50 times. Each indicator comes with a two-part label. The first is affixed to the shipping carton and announces that Drop-N-Tell is present on your shipment, and the second affixes to the bill of lading or other shipping documents. 25 sets per case. Resettable shock indicators can be shipped via UPS.